It was with deepest sadness and great regret that we learned of the untimely passing of our dear fiend – everybody’s friend – Tim Molloy. It was a tragedy inn our parish, because very few, if any, did such Trojan work for our community and there were still many good works and charitable deeds that he could and would have done in his own quiet and efficient way had God not chosen Tim to be with him in Paradise. In all his years in business he was always courteous, considerate and kind to all, but what we will remember him best is that ever-present quiet smile whenever anyone had the pleasure of calling into his shop. It invited a chat and he was always only too happy to indulge in a bit of ‘craic’ with his customers. That genuine smile was as natural as himself, it was a visible expression of his gentle, placid and peaceful personality: a mirror of his soul. Dropping into Tim’s shop was always a pleasurable experience even at one minute to 10p.m., his closing time, to purchase maybe a box of matches or youngsters needing a chewing gum. It was important. He gladly made the sacrifice to satisfy his valued customers. He was a perfect host. His smile of welcome always shone out like aradiant ray of sunshine. Tim’s Commitment to the P.T.A.A. Tim made many commitments during his too short lifetime. His primary one was the first one he took while still in his teens. He joined the Pioneer Total Abstinence Association. 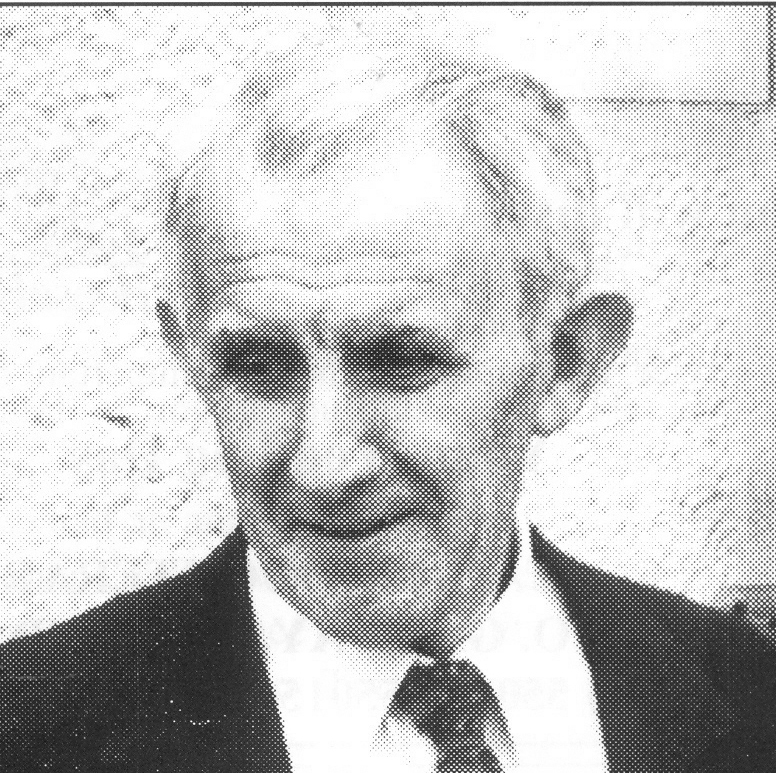 Michael Monahan, Sergeant Flynn, Bernie Walsh and a few others established Oughterard’s First Pioneer Centre in 1944. Once out of his teens, he realized the importance of the Pioneers to the youth of the parish and perhaps some adults as well. He dedicated himself to promoting it for the rest of his life. Yet extroardingly he never accepted the position of President of the Centre. He did, however accept. The position of treasurer, which he held throughout until he died. Tim qualified for the Pioneer Gold Pin for 50 years of dedicated service in the pioneers association in 1998. He was the pillar of the Pioneers and it was only through his perseverance that it has survived to this day. Tim married Maureen Monahan in Collinamuck church on the 4th February 1958. It was the first wedding in the new church there. 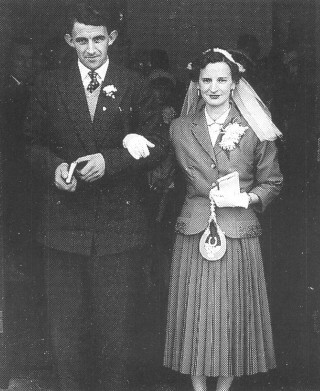 Theirs was a blissful marriage and they were so happy and contented until Maureen suffered a nervous disorder, which needed treatment in a Dublin hospital. Tim of course visited her every weekend to comfort, console and reassure her. Unfortunately the illness reoccurred several times a year afterwards, which proved distressful for both of them, especially over the years. Tim, however, was always calm and accepted their cross meekly and submissively. He never murmured, in spite of the distress he must have been experiencing for so long. Oughterard’s Regatta was one of his many hobbies from an early age. He was born near the lake and dedicated himself to it all down the years. The Oughterard Dramatic Society was another hobby and a great favorite of his too. He loved performing in plays, and spent twelve years on “ the boards”. Members of the society travelled to many towns and villages, from Moycuillen to Headford and centres in Connemara, during that time. The old Kirk hall was the principle venue for performances in the 50’s but it was very restrictive, especially on stage. Thomas Monahan, Tim’s brother-in-law was quite a comedian then and Mary B. Molloy was another “gas “ character too. From the outside, Tim’s shop looked like an advertising agency, what with notices and posters plastered all over the window. He was a very tolerant, charitable and charity-oriented person. He was always engaged in fund raising for some charity or other, and his counter was rarely without raffle tickets in aid of a charitable organization. He would never ask a customer to buy a ticket to avoid embarrassment to anyone. He was sensitive too and a shy unassuming man. Senior citizens activities figured largely in his work in the 70’s onwards, fund raising and arranging outings. He also ran a successful Bingo session for many years. Of course he had an annual appointment with everybody’s friend Santa Claus. The last organization Tim became associated with was the Western Alzheimer’s Federation, in which he became a tireless worker for six years and in that time he and his few assistants collected, would you believe £10,000. When he took on a project, he promoted and pursued it right to its climax. As a promoter and a motivator there was none to equal him. It was tragic that he should have departed this life just one month prior to the Western Alzheimer’s Federation official opening of its first hospital for Alzheimer’s patients, in Ballindine, Co. Mayo, to which project he had dedicated the final years of his charitable and untiring efforts in his own inimitable and outstanding way. Mary Anne, Tim’s only sister has spent the greater part of her life working in England. Tim and Maureen spent a few years working there before returning to open their own business here. I know that anything I have said as a tribute to that quiet, gentle and compassionate man falls short of his true worth, with his unique gifts of humanity, humility, kindness and above all charity. In his final few years he was stricken with ill health. We know that he suffered intensely in his last year – yet, he bore his pain with amazing fortitude and acceptance of the will of God and never a whisper of complaint. The Bible tells us “ God permits the good to suffer and the wicked to prosper”. Tim was a perfect example of that Biblical quotation. His passing at age 69, leaves all who knows him well with a deep sense of sorrow at his irreplaceable loss to the community for a person blessed with extraordinary gifts. This page was added on 26/11/2010. I visited my cousin Tim in 1978 and spent a few hours with him and his wife in their apartment above their shop. He was a lovely man.